Baloch culture is rich, varied and deep-rooted. Balochistan held one of the earliest human settlements in the World in Mehrgarh around 7,000 – 3,000 B.C. There are plenty of evidence and artifacts concerning the richness of Balochi culture throughout centuries. Balochistan is one of the ancient inhibited land. The history goes back to around 15,000 years ago. During the last century French archaeologists discovered a new site in Balochistan at Mehergarh (Mehregan), which is believed to be the earliest civilization in the world. It pre-dates the civilizations of Egypt and Mesopotamia. The site was occupied from 7,000 B.C. to 2,000 B.C. and it is the earliest Neolithic site where “we have first evidence of domestication of animals and cereal cultivation – wheat and barely – and also the centre for craftsmanship as early as 7.000 B.C.There are many historical sites across Eastern Balochistan (politically part of Pakistan), Western Balochistan (politically part of Iran), and Northern Balochistan (politically part of Afghanistan). The Burn City in northern Balochistan is a unique archeological site and a prime proof of sophistication, engineering and planning. Evidence from these sites show a very clear deep rooted history of civilisation, craftsmanship and exploitation. Amir Tavakol Kambozia wrote that Cupper was first discovered in Balochistan. It was transported from Balochistan to present day Iraq by water-born vessels. The names Baloch and Balochistan appears in literatures as old as 2000 years ago. The Baloch had a very successful methodology in irrigation and agriculture as well as in cultivation and husbandry. You can read a great deal in the history section. Despite the brutal political oppressions in Balochistan, the Balochi literature has emerged strong and vibrant. Baloch poetry is one of the most beautiful poetry and one of the oldest in the World. In Baloch culture poetry has always been combined with music. Balochi music and folklore has been passed from generation to generation as a valuable art. Baloch handicraft are world-renowned – be it Baloch carpets and rugs or embroidery. The Baloch are very hospitable, nice and friendly. They are generally intelligent, learned, well-informed, initiated, cultivated, socially accomplished and politically attentive. Culturally, they are rich and self-dependent. The deliberate deprivation is a political tool used by the central governments of Iran and Pakistan in order to ensure Balochistan and particularly the Baloch people are kept back-ward. The occasion of the birth of either a male or a female child was marked with much music and singing. The women folk attended the mother for seven nights and sang sipatt or nazink , literally meaning songs of praise. Food and sweets were prepared and distributed. The birth of a boy was greeted with greater rejoicing than the birth of a girl. Among some tribes no ceremonies were performed on the birth of a girl, while among other tribes usual ceremonies were performed from birth to death. They included birth, sasigan (selecting name on sixth day), burruk (circumcision), padgami (child’s beginning to walk) and salwar (wearing of trousers) etc. Hal was giving and receiving news when one chanced to meet another. It was an obligation, and always reciprocal. A person must communicate the latest happenings which may include the prices of essential goods in a nearby market or some political events o a more serious nature. This helped in conveying the latest happening in remote areas. When travelling in groups, the hal was given by the elderly person of noble birth. This was called chehabar. To reveal or receive hal was a mark of distinction. Mestagi was the reward for giving good news as birth of a son, news of the arrival of a lost relative or report of a victory in the battle. It was appropriate and according to the good news conveyed. The Baloch had an open society with its unique charachteristic of equality and freedom, which is now deep-rooted. Every Baloch was expected to be active member of the tribe. He took part in discussion in diwan which was open to everyone, at the house of the Sardar or the elder. Sometimes there were separate place, diwanjah, for such getherings. Social, political and economic peoblems concerning the tribe were debated in these assemblies. Diwan literally means gathering or assembly. Diwan in it formal nature was to be participated in by the elders and elected personalities. In all informal get-togethers everybody felt his presence. This spirt had made the Baloch into a close knit tribal structure based on mutual benefit and loss. The house of the leader, or diwanjah was the place where history, legends, ballads, drama, lyrics and tales of love were told and sung. Every one wished that he could exert himself and attract others by his knowledge and manners during such discussions. The Baluchis are the ancient genuine Iranians who have their exclusive and special celebrations and feats.Pir Mohammad Mulla Zehi who is an expert in the Baluchi culture has studied selected examples of such ceremonies and has classified them into two categories of cooperation and feats. Beggari, Hashar, Bagi, Divan, Mayar, Karch-va-Kapon, Patardeyag, Mangir and Sepat are among the said ceremonies that are discussed in the following article. Text: For a curious visitor who arrives in Baluchistan, the first interesting issue that attracts the attention most is the way Baluchis are dressed up. Baluchi people have preserved their way of clothing with a slight change. Men wear long shirts, loose pants and a turban around their heads while women put on loose dress and pants with needle works that are special of the people of the area and is not common in other parts of the country. The upper part of the dress and sleeves are decorated with needle works, an artistic work that is specific of the clothing of the women Baluchis. They cover their hair with a scarf that is called `Sarig’ in the local dialect and wear `chador’ over it. Apart from the dressing style of the Baluchis, there are interesting points in the way they live and in their traditions and customs that this article tries to illustrate in parts. Indigenous and local traditions and customs were of greater importance to the Baluchis in the past as apparently up to about half a century ago when the central government established its control over Baluchistan, local governments of the chieftains were imposed as the individual dictatorships. Therefore, it can be concluded that there were no formulated laws and regulations in order to regulate social behaviors. Only the rules of the religion were valid and practicable. Under such circumstances, traditions and customs in fact filled the vacuum caused by the absence of laws which were used in the regulation of many social relations and therefore enjoyed special credit among the Baluchi tribal people. Such a tradition is so strongly respected that even the poorest member of the family cannot remain indifferent towards such a demand and feels obliged to pay a certain amount of money in cash or offer material aid. Lack of participation in such a benevolent affair will cause humiliation and disgrace for the Baluch who would be rejected in the Baluchi community. Therefore, although Beggari is a voluntary contribution, however, a social compulsion can be traced in it somehow. Even in the case of those who have no children and cannot benefit from the advantages of Beggari in future, participation in this benevolent act guarantees further social credit. As a result of this, marriage is being made more easily among Baluchis as the community is meeting the cost. This is a custom that is applied when an individual cannot perform a task alone and needs help of the others. As working for money is not customary among Baluchis, those who need help would go to their relatives and friends and would inform them of their decision to do a special job on a specific day and for that purpose they need a certain number of work force. Under such circumstances, as many volunteers may join the collective work without being paid. If the work is accomplished within a day, the only thing that the employer has to do is to prepare lunch and dinner for the workers by usually slaughtering a sheep for making the required food. If the work takes longer, more preparations will be made and new volunteers will substitute the previous ones. However, there would be enough volunteers to complete the work through collective cooperation, as it is not customary to give a negative response to the call for contribution. Such a habit is mostly customary in rural areas where people are mainly engaged in agriculture where Hashar is being practiced in various stages of the work from cultivation to harvest. It is also widely practiced in building rural houses and bridges and in collecting dates. Such a habit is still practiced given its positive social effects despite the fact that working for money is gradually established among the Baluchis. This habit was widely practiced in the past while these days it is losing importance in areas going through the trend of urbanization. In the practice of such a habit, people are used to cook extra food and would distribute it among needy people in their neighborhood. Those who were well off and could have better nutrition would carefully observe this. The positive social impact of such a tradition has removed the negative feeling of humiliation as receiving Bagi is not tantamount to receiving donations but rather is some sort of contribution among neighbors and is not limited to a specific person or a specific family. Bagi is not merely confined to foodstuffs but is performed in a wider dimension that forges greater convergence among neighbors and minimizes probable disputes. At the meantime, it helps fair distribution of limited facilities. Among Baluchi people, settlement of disputes in their everyday life is of great importance. In order to solve problems, people would gather in a place and while studying various aspects of disputes, they try to find the best possible solution in an effort to secure satisfaction of the parties involved. The place in the local dialect is called `Divan’ and is normally a house that belongs to the eldest member of the community. Of course Divan is not merely exclusive for the settlement of disputes but is also used for exchange of information and consultations for the coordination of affairs. However, the significance of Divan at the time of the settlement of disputes lies in the fact that although decision-making at Divan is not legally valid, however, it is applicable and is rarely ignored by the parties to the dispute. The reason is that presence of the gathering at the place is to some extent the executive and moral guarantee for the parties to the dispute and if one party for any reason ignores the agreement reached at Divan, in fact it would damage its own social credibility. If Divan fails to settle the dispute, the case will be solved on the basis of the rules of the religion. The two parties to the dispute will be brought to the clergy in the area who will judge between the two. The religious ruling will be usually issued at the mosque in order to secure a stronger guarantee for its application. But, this is not necessarily essential as the ruling can be also issue in Divan or at any other places. The habit of Divan is being gradually forgotten in both rural and urban areas but it is still being enforced among tribal Baluchis. Laws in fact have substituted Divan and the elderly people are still settling regulations in rural and urban areas but not completely as in primary stages attempts are made to resolve the disputes through local traditions and at the Divans of the elderly. But, as soon as he accepts, the social tradition puts the responsibility of the Mayar’s defense on the shoulder of the host. Of course, the importance of the habit becomes further evident when the person who seeks help is not guilty and whose rights have been trampled upon. However, when the person seeks help according to the tradition of Mayar, he becomes a member of the family and tribe of the host and can enjoy his support until his problem is solved. Under these circumstances many innocent people will become victim of such a revenge merely for belonging to a certain family or tribe. At this moment, in an effort to prevent further bloodshed, the elderly members of the family resort to the custom of `shroud and knife.’ They send the murderer together with a knife and a piece of white cloth to the family of the person who has been killed and they are free either to punish him or forgive him. However, punishment of the murderer is not a proven act from social and scientific points of view while forgiveness is the manifestation of generosity. For this reason, the murderer will be forgiven and returned to his family. Sometimes it may happen that in order to remove all the hostilities and misunderstandings, the two families prepare marriages as a means to put aside differences. Of course, sometimes ransom would be demanded. In that case the family of the murderer or the tribe to which he belongs will pay the money. Although prosecution of the murderer falls within the authority of the law, however, there are still evidences indicating that tribal people are willing to safeguard the tradition of `shroud and knife’. This habit is practiced when there is a quarrel between two or more members of a tribe. The side that is guilty of fomenting the quarrel accepts to apologize but not verbally rather through a mediator who is usually an elderly of the tribe. No matter how deep the difference, the other party usually accepts the apology, as its rejection will cause criticism of others. The important Baluchi traditions are mainly in connection with their ceremonies and feats. The marriage ceremony stands prominently among such festivities as it goes through different stages starting from engagement to the wedding ceremony. Public participation in the wedding ceremony is normal as in other parts of the country but with slight differences. But there is one exclusive difference in the Baluchi wedding ceremony and that is the Mangir ceremony. It seems that the ceremony is a habit acquired by the Baluchi tribes from other people such as African slaves who have been probably brought from Africa to Baluchistan. Mangir is the ceremony for the simultaneous mass marriage of several couples for various reasons, notably economic considerations. What further supports the idea is the holding of mass wedding ceremony among lower class people of the society. This would not only reduce the costs but would also economize in time as in the past wedding ceremonies used to last for seven days. Festivities that are held in Baluchistan at the time of the birth of new babies are called Sepat. Some parts of the ceremonies are influenced by superstitious presumptions believing that both the baby and the mother are threatened by a genie called Aal as it awaits the opportunity to seize and swallow the liver of the baby and the mother. Therefore, in order to prevent such a happening the relatives of the mother and the baby stay awake for several nights and pray to God and seek His help in order to protect the mother and the baby against the genie. However, there are good and bad habits among the Baluchi tribes that demand more research works and studies. The Baluchis are known for their cultural specifications such as hospitality, faithfulness, and moral commitment as well as deep-rooted religious beliefs and attachment to their homeland. Marriages which generally took place after puberty were performed with ceremonies which included music, dancing and distribution of food. The girl was usually a few years junior to the boy. Marriage was arranged to a closely knit family. Expenses of food prepared on either side was borne by the bridegroom. To meet the expenses and amount of labb, bride price, relatives of the bridegroom collected bijjari, subscriptions from friends and relative. Traditionally, everyone who was asked gave according to his means. Sheeps, cows, goats or camels were also presented as bijjar. Relatives of the bride also collected bijjar called giwari on the marriage evening. The general characteristics of a wedding included negotiations by parents and other relatives. All details were agreed upon and the wedding was formalized later on. Labb was fixed before hand. Sang or harbarsindi, betrothal, was the first step. The expenses, pardach, was incurred by the bridegroom. Pardach was paid in cash and kind before by the marriage date. It also included embroidered clothes and other essential articles for the bride. Sang was almost as absolute as the marriage itself. After engagement, the parents of the girl were bound to give the hand of the lady to the person to whom she was betrothed. There was no backing-out from either side save in exceptional circumstances. Only in rare cases, could the man forego his fiancée, distar. Sahbadal or system of exchange of girls between families without stipulations paid was also prevalent. Sometimes conditions were made that a daughter born of a marriage would be given to relations of bride’s parents. However, if there was a marked difference in the ages or personal attractions of would-be-bride and bridegroom, it would then be compensated in money by either side. Betrothal in childhood among close relatives was also common. Another peculiar custom was that a week before the marriage, the girl was secluded from the rest of the family. Only the closest female relatives and friends could visit her. During this period she was also briefed regarding her duties and responsibilities after marriage. After sun-set the bridegroom profusely arrayed, accompanied by close friends and relatives moved to the bride’s house where proper arrangements were made. Formal wedding was performed after the guests were feasted. In Baloch society an offence against the individual such as theft or robbery was a corporate against the entire tribe. Any contravention was punished according to the nature of the crime committed. But if the offence was committed outside the tribe, it was considered an offence against that tribe. The individual acts consequently would become the responsibility of the tribes concerned. His family and the entire people suffered. The opposing tribesmen could revenge the guilt in an appropriate manner, not necessarily against that particular individual but against any person belonging to the tribe of the offender. Sentence for misdemeanor was the payment of appropriate fine or compensating the loss of property in case of theft or robbery. Sometimes robbery was also punished with death. Punishment of corporate crime was outlawry of person, that is, disowning the individual and declaring him isolated from the tribe. This was one of the major punishments and rarely awarded. In that case he was also banished from the area. There is least evidence of awarding punishment of dore kassag, tearing to pieces by horses; pahao, hanging, which was awarded to traitors and the enemy agents. These forms of punishment nevertheless were clearly a later addition and not the original Baloch practices. Beheading was the common mode of inflicting the sentence. There is, however, no evidence of any permanent hangman or jallad among the Baloch for the purposes of executing criminals. In Kalat State, there was no permanent post of a hangman. Death sentence, however, was always awarded in public. There is no evidence of punishment of death by drowning, throwing from rock, burning or burying alive, pouring molten lead on the criminal, starvation in the dungeons, tearing to death by red hot pincers, cutting asunder and stoning to death, or the Persian and Mughal practices of blinding and maiming. Most of these forms of punishment were prevalent in Semitic societies and sanctioned by Mosaic Law , (Jews used these forms of punishments against the conquered peoples in Palestine in the Biblical times), and later on crept into many cultures through Islam. In case of murder the relatives of the deceased had the inalienable right to claim blood for blood; and this claim had the tribal code of conduct, the deceased family and the entire tribal strength behind it. The murderer could be forgiven only by the nearest kin. Among a few tribes blood compensation was given by the offender or his family. Relatives of the offender had to accept the punishment and were obliged to agree to the award if no settlement was reached. Extreme torture or dishonouring was against the tribal norms. Torture to low-castes involving serious crimes was sometimes perpetrated. The Baloch thought it more honourable to be beheaded than hanged. Other modes of capital punishment were insulating. The only crime which could invoke death penalty or banishment besides treason was adultery. Sometimes mere suspicion of unfaithfulness by wife was sufficient to put her to death. The man would also get the same punishment. But among some tribes who were alleged to be inferior in caste, the adulterous woman was divorced and the adulterer was obliged to marry her. In case of adultery there was no need for the aggrieved husband to resort to any tribal council to get a decision. He himself inflicted the sentence. The unmarried women or widows get punishment from their near relatives. A very peculiar cultural trait was that even the criminal or offender, if apprehended, would never tell a lie even in the face of instant punishment. This was against his sense of honour and pride. he was always truthful. This made torture to extract information or confession of guilt quite unnecessary. Among the ancient Baloch, like other Aryan groups, trial by ordeal was perhaps in vogue. The culprit had to prove his innocence by walking through the fire or putting his hands on a hot rod. In Balochi folk stories there are numerous instances when the innocence of the offender had to be proved by putting his hands on the hot stones, tapag. This practice was perhaps discarded early in the Christian era. In most cultures any child of less than ten years was usually considered incapable or guilt on the ground that he or she was too young to differentiate between right and wrong. The practice was completely reversed among the Baloch. The Baloch child had a penetrating sense regarding his enemies and friends. Old blood accounts sometimes were settled by persons of less than ten years. A Baloch child took part in battles. Therefore, the case of guilt or criminal responsibility for the minor was always judged according to circumstances and merit of the case. The members of the family of the minor would have to bear the responsibility of his guilt if the crime was provoked by them. The home of any Baloch elder was a safe refuge and place of protection for all the offenders of law till the decision of the dispute through the Jirga or med. The Balochi language is divided in several dialects: Eastern Balochi, Western Balochi, Northern Balochi and Southern Balochi. Each of these dialects are divided in sub-dialects. For example Rakhshani and its subdialects: Kalati, Panjguri and Sarhaddi), Saravani, Lashari, Kechi, Coastal Dialects, and Eastern Hill Balochi. Northern Balochi dialects are settled north of Iranian Balochistan and Golestan Province of Iran, north of Nimruz Province in Afghanistan and north Chagai District of Balochistan and north of Sind in Pakistan. Northern Balochi dialects are similar to northern Rakhshani and southern Makkorani dialects. Southern Balochi in Iran are living in Southern of Sistan o Baluchestan. In Pakistan Southern Balochi are settled in Southern Balochistan, Southern Sind and Karachi. In Oman most are settled in Muttrah but some settle along Omani coastline and they can be found all over UAE. Western Balochi in Iran are living in Northwest and Southeast of Sistan o Baluchestan and very few of Western Balochi people can speak Persian. In Pakistan Western Balochi are settled in northwest of Balochistan. In Afghanistan they are settled along Helmand River and Zaranj area, in the southwest desert region and Mari region in Turkmenistan. Eastern Balochi are settle in northwestern Balochistan, southwestern Punjab and northwestern Sind in Pakistan. Balochi Dialects by population, region, religion, and languages estimated by the government of Pakistan in 1998. Balochi is the principal language of Balochistan. There are several other minor languages which are spoken at the ethnic borders of united or Greater Balochistan. The speakers of minor languages (Brahui, Saraiki[? ], Sindhi[? ], and Dehwari-Persian[?]) are bilingual. Persian and English were used as official languages in western Balochistan (Iran-Afghanistan), the Khanate of Balochistan, and British Balochistan. In 1947 the independent Khanate of Balochistan announced Balochi as an official and national language, a policy which was continued until March, 1948. In 1948, with the incorporation of Balochistan into Pakistan, Balochi was replaced as the official language and Urdu as the national language. The official language in the areas of Gwadar[?] (occupied by Sultanate of Oman until 1958) was Arabic. Balochi has several dialects. 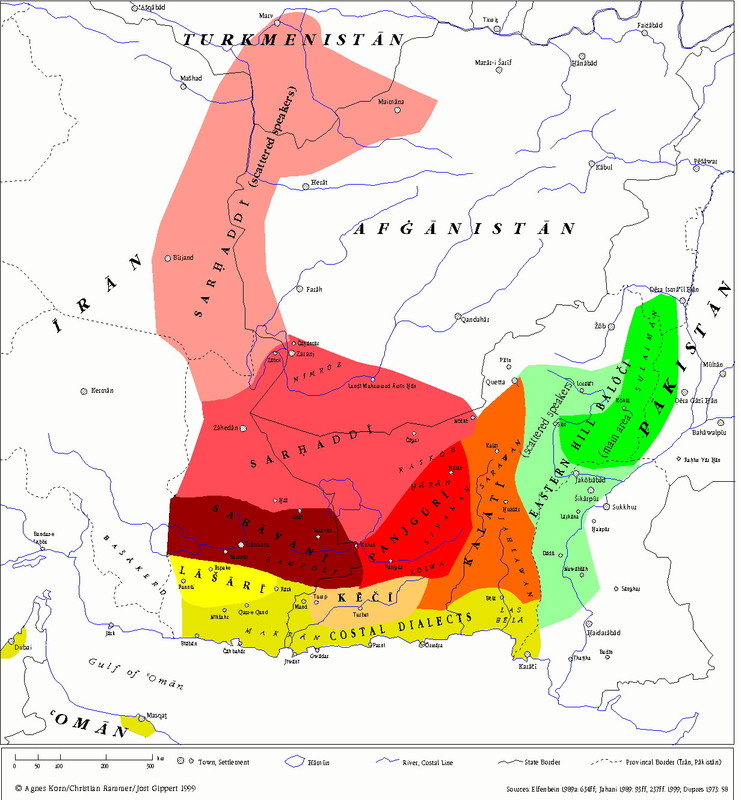 Linguists agree on the following two major dialects: Eastern Balochi and Western Balochi Table of contents 1 Eastern Balochi 2 Western Balochi 3 History 4 Origin 5 Script and Ethnic Borders Eastern Balochi The eastern Balochi dialect is spoken from Karachi northwards up to Dera Ismail Khan and to the Suleman Mountains, including the Marri Bugti areas. And amongst the Baloch of Sindh, Derajat and Punjab, and the north west frontier province of Pakistan. This dialect has borrowed several Sindhi (including Saraiki) and Pashto words and has also contributed to the vocabulary of the said languages. Western Balochi The western Balochi dialect is spoken between Karachi (Pakistan) and Kirman[?] (Iran), among the Baloch of Turkmenistan, the Sultanate of Oman, the Khorasan[?] province of Iran and Seistan (Iran-Afghanistan). The dialect has borrowed several words from neighboring languages such as Turkmen, Persian, Pustho and Arabic. History Balochi has a different historical background and has no affinity with any Indian language. The memorandum of independent Khanate of Balochistan submitted by M. A. Jinnnah to the cabinet mission in 1946 declares: On the point of view of language, there is very little affinity between India and Kalat. The Balochi language belongs to the Iranian branch of the Indo-European family. The Brahui language was said in the same memorandum, to be a Dravidian language having no affinity with any Indian language except the Gond dialects in central India. Discussing the relation of the Balochi language with Persian or Pashto (the national language of Iran and Afghanistan), Harrison writes: ‘Balochi is a distinct language and is closely related only to one of the members of Iranian language, Kurdish, but it retains striking peculiarities of its own.’ Origin The Balochi language originated in a lost language, related to those of the Parthian and Median civilizations. It is classified as a branch of the Iranian group of the Indo-European language family like Kurdish, Persian, Pashto, and Ossetic. Historically, Balochi was believed to have originated between 200 B.C.E. and 700 C.E. J. Elfenbein, a scholar of Balochi, compared Balochi with Parthian and Persian of middle stage and concluded that: ? ancestor of Balochi was neither Parthian nor middle Persian but a lost language, which, sharing a number of characteristic features with either, and some with both, had pronounced (characteristics) of its own. Referring to the affinity of Balochi language with Kurdish, having an ancient Medean background, this author has stressed that Balochi has its own unique features. The same view presented by L. Dames in his book Baloch Race, in which author reported that Balochi resembles the Zand[?] or old Bactrian[?] rather than old Persian. This special position of the Balochi language, having no real affinity with the Indian subcontinent and being a distinctive language along the Iranian group of Indo-European language family, has strengthened the consciousness of the Baloch people in their demand for the right of self-determination. Script and Ethnic Borders Before the 19th century Balochi was a unwritten language, used in conversation in the Baloch courts. The official written language was Persian, as in India and central Asian kingdoms. It was British linguists and political historians who introduced Balochi in a written form with Roman script. In the late 19th century and later, the Baloch scholars who were influenced either by their geographical or historical environments or by their political thoughts, adopted Nastaaliq[?] (Persian script) and Naskh[?] (Arabic script). The Naskh script became popular among the Baloch scholar, intellectual, and journalists. A smaller group of Baloch linguists and scholars favoured the Roman script, but the didn’t have a popular and powerful voice until 1948.